Sun Mountain Sports' auto-operation, double-canopy umbrella is perfect for playing golf in the rain or sun. The silver umbrella is UPF-rated 60+ and black is rated 30+. The rubber-covered, slip-resistant handle fits perfectly in the umbrella holder of Sun Mountain carts. Sun Mountain Sports &apos; auto-operation, double-canopy umbrella is perfect for playing golf in the rain or sun. 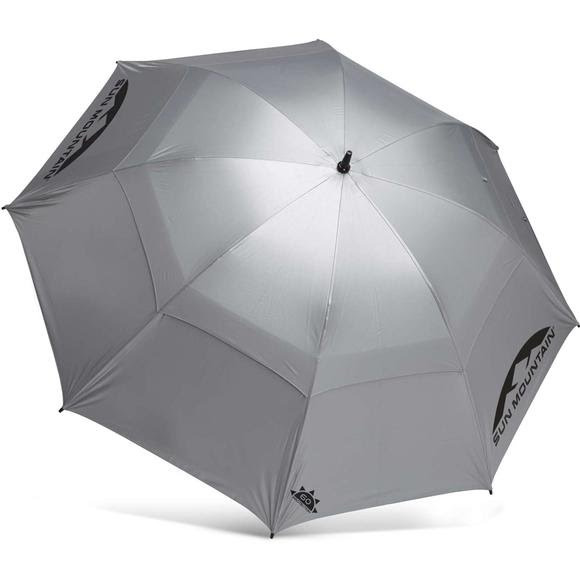 The silver umbrella is UPF-rated 60+ and black is rated 30+. The rubber-covered, slip-resistant handle fits perfectly in the umbrella holder of Sun Mountain carts.